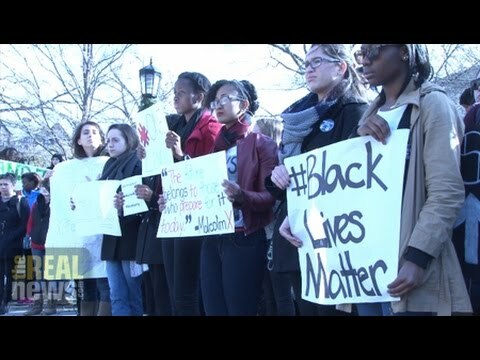 MEGAN SHERMAN, TRNN PRODUCER: In Baltimore on Wednesday, December 10, dozens of Loyola University students marched on their local campus against the killing of unarmed black men and police brutality. They walked through the university chanting and shared testimony of their experience with racism at the school as well as in surrounding communities. UNIDENTIFIED: I was born and raised in Newark, New Jersey, in a system where black fathers spend more time in jail than they do with their family, and where blacks, a young black male like me, spend more time on the streets than they do in colleges. And so I understand the system. I understand where Mike Brown is coming from or where people in Ferguson are coming from. And I just want to say, when I look at Loyola, I see a little bit of Ferguson in Loyola. SHERMAN: This action, is along with a student-organized die-in that took place at Johns Hopkins University, were just the latest in a wave of sustained protests in Baltimore and across the country after grand juries failed to indict police officers for killing Michael Brown in Ferguson and Eric Garner in New York. Students mentioned that this was the first protest of its kind at Loyola. Here are the voices of some of those who participated in the action. JOY HOLLAND, LOYOLA STUDENT/ORGANIZER: We needed to raise awareness that it’s not just Ferguson; the same things are happening in Baltimore each and every day, with Tyrone West, 72 weeks of Wednesdays. And this is our first time campus even being aware of these things. It is time for us as a community to branch out and be involved and show Tyrone West and show everyone around us that we are not going to stand for the injustice that we see each and every day. We are going to be involved in the Baltimore community more than ever. ALICIA ESPINAL, LOYOLA STUDENT/ORGANIZER: We felt that it was necessary not only for us to educate the people on this campus but to also stand up for the rights of not only us, but every person of color that is outraged, experiences something of that magnitude of what happened in Ferguson, especially because people on this campus are not willing to be educated about these things. And I feel that, like I said before, I feel that it is our duty to inspire them. JAZMYN BARRETT, LOYOLA STUDENT/ORGANIZER: Even though I’m investing into my–to my own degree, I’m investing in my own future to be a productive person in society, systematically the resources on this campus are not being funneled my way. Opportunities are not being funneled my way. Support is not always funneled my way. And if it is, it’s from someone who looks like me. The person looks opposite of me ignores–her school says verbatim on the website repeatedly that [is it (?)] about diversity, an inclusive environment, and environment for all of us. So I want what I paid for. I want what I expected from this university. And all I’m asking for is that to be looked up to. I want a curriculum that teaches about me. And if it has a D at the end for diversity, I want to walk out and I want to see my peers have a course that does just that. KYHLA DESIREE, LOYOLA STUDENT/ORGANIZER: This was our message to Loyola that we will not be silent anymore. We’re ready to combat what they’re doing to us. Silence is not going to be our answer. SIMONE ROBERTS, LOYOOLA STUDENT/ORGANIZER: I want to feel like my life matters. I paid $57,000 to go here a year, and you haven’t even acknowledged the fact that we have a racial issue on this campus. That’s a problem. And working in admissions, I’ve seen the things that go on in the background, and, like, there’s absolutely no regard for black life, minority life, on this campus at all. DEBORAH NGBADAMOSI, LOYOLA STUDENT/ORGANIZER: We just need to align people. We need to educate them on–because some of those people on campus have never seen people like me before, they’ve never seen a black girl. You know. And I want them to be educated on their actions and to make sure they know, like, we are here. It’s about that time for our students to come together, because the students’ voice is stronger than any other voice on this campus.